Narcissism is essentially a problem of lack of empathy. Empathy is vital for cooperation and friendship. Without empathy, there would be no humanity – just a world of disparate individuals without the social glue to hold them together. Empathy is an experience of understanding another person’s perspective – you place yourself in their shoes and feel what they are feeling. When we empathize we not only mirror the distress of the other person, but are moved to respond in helping ways. In other words, empathy helps us take care of one another. When we are distressed by the suffering of others, that distress becomes the seed of our compassion. No one is empathic all of the time, and some of us are more empathic than others. Some individuals show so little interest in the well-being of others that their lack of interest could be called neglectful. What causes people to be capable of seriously hurting one another is not entirely understood, but when our empathy is “switched off” and we operate solely on an “I” basis. That is, viewing the world as if we were the only ones who exist or matter. Individuals such as: “I exist you do not” are much more inclined to regard other people as objects. This is the viewpoint held by narcissists. Our genetic makeup, upbringing, social environment, physical and mental wellbeing, age and emotional maturity all affect our ability to empathize. Furthermore, our ability to be empathetic is not fixed. One moment we can feel highly empathetic and then emotions like anger or frustration can get in the way and prevent us from feeling the same level of compassion towards other people, even those we love the most. In all probability empathy developed in the context of parental care. Infants smile and cry in order to urge their parents to help them. The first type of empathy most humans experience is termed emotional contagion (i.e. the unconscious ability to mimic another person’s emotions) and is understood as an innate trait in humans. It is observed, for example, when infants contagiously giggle and gurgle along with other infants. Empathy develops from this early prototype when a child meets normal developmental milestones. It has been hypothesized by many theorists that individuals with Narcissistic Personality Disorder are suffering from developmental arrest characterized by a failure to internalize a relatively stable and positive self-image and the mental apparatus necessary to maintain it in the face of slights and disappointments that inevitably occur in life. Presumably, normal functioning people have had numerous experiences as an infant and child of being admired and understood by their primary caretakers, while the narcissistically vulnerable person did not. The lack of empathy that the Narcissistic individual demonstrates towards other people’s feelings and needs can thus be understood as the natural consequence of having been insufficiently empathized by primary caretaker during childhood development. Empathy is a multifaceted construct that involves both the affective experience of the other person’s actual or inferred emotional state and the recognition and understanding of another’s emotional state. It also involves the ability to monitor oneself and to maintain and regulate Self-Other awareness. Unlike related processes such as sympathy, the essence of empathy reflects the ability to separate oneself from others’ experiences and recognize possible emotions and alternative perspectives. As mentioned, empathy typically emerges early in life, usually within the second year of life and greatly depends on the nature of human interactions (e.g., caregivers’ style, family environment) to support Self-Other awareness and conscious concern for others. Other factors such as temperament and genetics also influence the development of empathy. Thus, both genetic and environmental effects shape empathetic processing. 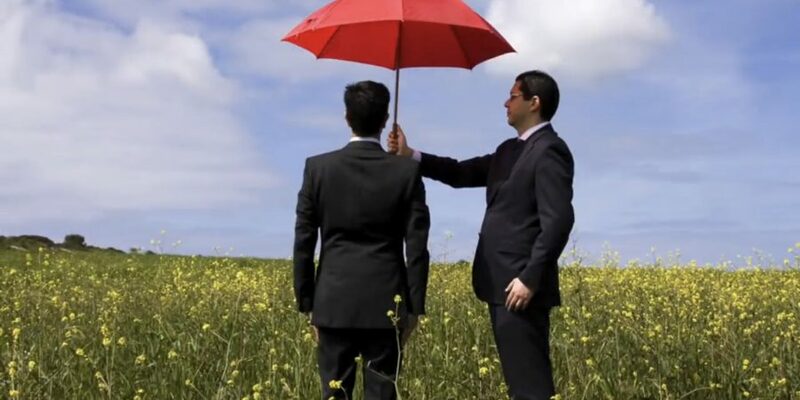 Cognitive empathy is knowing how the other person feels and what they might be thinking. This is sometimes called perspective-taking. There can be a very dark side to this sort of empathy. In fact, those who fall within the Dark Triad – Narcissists, Machiavellians, and Sociopaths (aka AntiSocial) have this ability, while having no emotional concern whatsoever for their victims. Affective or emotional empathy is when you feel along with the other person. Emotional empathy enables someone to tune into another person’s inner emotional world. Our own experience of feelings (feeling sad, happy, outraged, etc.) helps us to feel along with the other person. If our own range of feelings is limited, for example, a sociopath’s feelings may be restricted to base feelings like anger, envy and self-pity; this may mean they have difficulty recognizing feelings in others that they don’t readily access or process in themselves. Conversely, a highly sensitive person may have an expansive emotional range to draw upon to aid them in emotionally empathizing with other people. One downside of emotional empathy is when people lack the ability to manage their own distressing emotions. This can lead to emotional exhaustion and distress. Doctors and healthcare workers often have to employ purposeful detachment as a way to inoculate themselves against stress and burnout. In such circumstances they use their cognitive empathic skills as opposed to their emotional empathy to aid them in their work with their patients (McGregor, 2017a). Of course, there is a danger that when one employs emotional detachment this can lead to indifference, rather than well-regulated caring. So people who work with people, whose business it is to show care and concern for others, need to find ways to maintain a healthy balance in their own Self-care in order to continue to provide compassionate care to others. This takes is emotional intelligence and to manage emotions in a positive Self-Other enhancing way. Putting empathy under the functional magnetic resonance imaging (fMRI) of the brain— Professor Simon Baron-Cohen from the University of Cambridge, England explores new ideas about empathy. He suggests that the level of empathy most of us experience varies according to the conditions we face at any given moment, although all of us have a pre-determined level of empathy which we generally return to (i.e. our preset position) on what he calls the “empathy spectrum” (Baron-Cohen, 2012). Imagine we each have an empathy circuit in the brain that determines how much empathy we have. Professor Baron- Cohen suggests that there are ten regions of the brain which make up what he terms the empathy circuit (Baron-Cohen, 2012). Many of these regions are involved in actively coding our experiences and are automatically active when we perceive others behaving in similar ways or having similar experiences. Neuroimaging (brain scan) studies lend support to the idea that narcissists, like psychopaths, have abnormalities in the empathy circuitry of the brain. 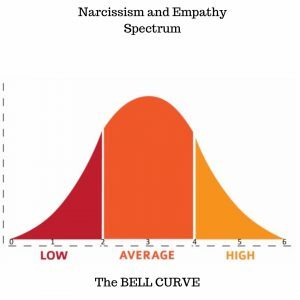 The Narcissism and Empathy Bell Curve (Baron-Cohen, 2011) pictured below shows that most people have middling default empathy (they are positioned anywhere between points 2-4). Few people have no empathy (point 0) and few people are extremely high in empathy (point 6). Point 0 No empathy and hurting others means nothing to them. Point 1 Capable of hurting other people but feels some regret if they do so. Point 2 Has enough empathy to inhibit them from acts of physical aggression. Point 3 Compensates for lack of empathy by covering it up. Point 4 Low to average empathy. Point 5 Slightly higher than average empathy. Point 6 Very focused on the feelings of others. An almost unstoppable drive to empathize. Can we develop and improve our empathy ? Most of us can develop and improve our empathic abilities, however some individuals, particularly those at point zero, such as narcissists and antisocial (a.k.a. sociopaths, psychopaths) may find that lack of empathy of the emotional or affective kind is a permanent state (McGregor and McGregor, 2013). Narcissism and empathy appear to be polar opposites. For the majority of people however, whether we show and make use of our natural empathy is dependent upon a lot of factors; one of which is how comfortable we are about feeling certain feelings in ourselves. Some people are fantastically empathetic and helpful when it comes to showing care and compassion for other people, but have very little empathy when it comes to dealing with someone else’s outrage. Some close down in the face of violence and abuse, and some cut off completely from emotions they are frightened of in themselves. Narcissists tend to have low to no empathy default positions, although of course, there is individual variance even with a narcissist (McGregor and McGregor, 2014). The Empathy Quotient or EQ test that is intended as a measure to determine how easily you pick up on and how strongly you are affected by others’ feelings (Baron-Cohen and Wheelwright, 2004). If you wish to take the test, you need to respond to 60 short statements and rate how strongly you agree or disagree with them. There are no right or wrong answers, or trick questions. At the end of the test your EQ score is calculated for you. This may help you gauge your default empathy position. The EQ test is available online https://psychology- tools.com/empathy-quotient/. …and help you figure out where you are on the narcissism and empathy spectrum. It is thought that differences in their brain circuitry account for their lack of reaction to other people’s distress. This said, while scientists have made progress in revealing mechanisms thought to enable a person to feel what another is feeling, the evidence, and our understanding of what helps and hinders empathy, is far from complete. We do not yet have a nuanced understanding of the environmental and biological influences or how they interact. Baron-Cohen (2012) proposes that there is an empathy spectrum and each of us are positioned somewhere along it. I enjoyed this article. I really appreciate the Empathy Quotient test. I always considered myself to being highly attuned to other person’s feelings. I called myself an Empath and my EQ score confirmed it. Narcissists find empaths like a shill would find an easy con. Empaths go along for the ride thinking they are helping when in reality they are playing into a sick game of circumstance until they realize they are being played instead of loved. Reading the article and seeing the chart makes me want to climb back up to a 4 and have more empathy me while still caring about others welfare as well. Thanks for the article.